Saturday evening at Silent Barn, the usual bored-looking über-hip were outnumbered by beaming tape nerds manning tables topped with an array of brightly colored cassettes; friendly dudes and girls repped tape labels hailing from Brooklyn and beyond, at the first annual NYC Cassette Fair. Though it may seem like hipster oddity or an impractical nostalgic whim to most people, cassette tapes have consistently been a relevant medium for underground music, witnessing the dawn, preeminence, and decline of the CD. 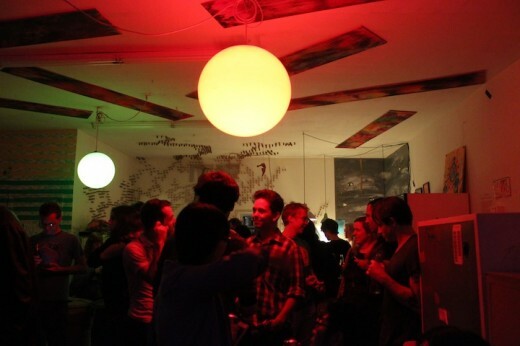 “It never really stopped,” Tom Pavlich said of tape culture. He was later seen snapping photos with a film camera — clearly a dedicated fan of analog stuffs in general. Pavlich runs Mirror Universe, a tape label based in Greenpoint. He handpicks the artists, recruits the bands for recording, and takes care of the cutting and distribution. The label puts out tapes for relative unknowns, but they’ve also made tapes for big acts like Washed Out before they were signed to Sup Pop. The label also recently released a tape, in collaboration with Indiana-based label Secretly Canadian, featuring The War On Drugs. 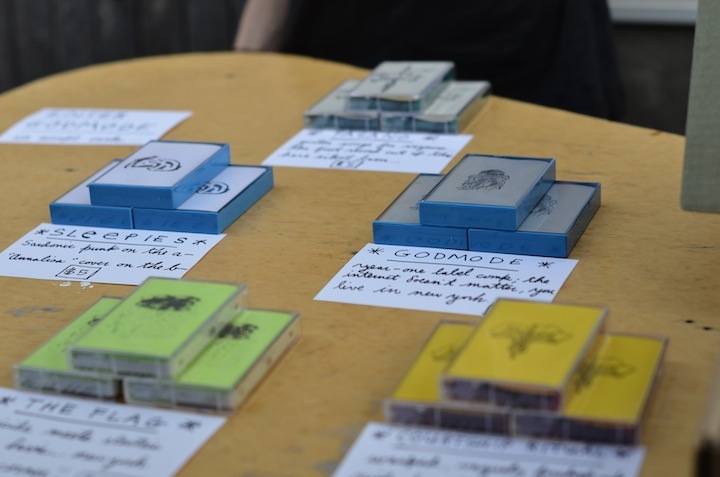 And though tapes never really disappeared completely from the underground music scene, the NYC Cassette Fair was a definite indication of a revival and evolution of a wider tape culture that’s currently underway. More established acts that before may have only ventured into vinyl to scratch their analog itch are backtracking, so to speak, and putting out tapes. Thanks to the Internet, tape labels are bringing together an unprecedented diversity of artists from not just across the country, but all over the world — facilitating collaboration, selling and trading music, and investing time and creative energy into creating and distributing cheap, accessible, listenable objects of beauty. 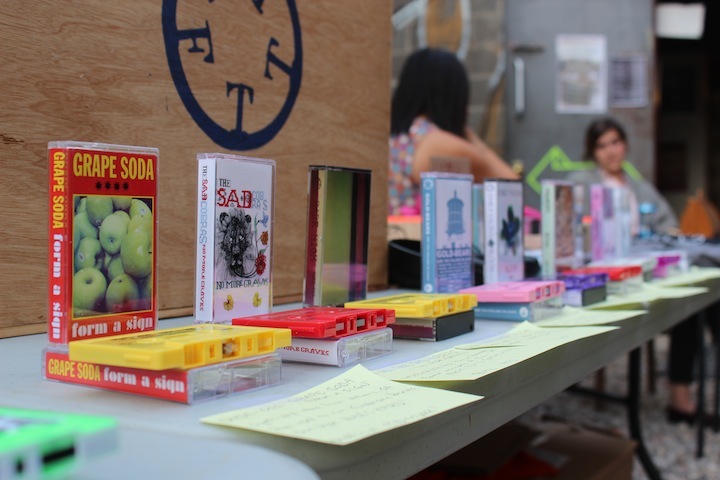 The tapes at the fest were magnetic, literally and figuratively – people took them out of cases, flipped them around, inspected the labels, and popped them into Walkmans. And it’s not just about the music: the objects themselves are an art form. 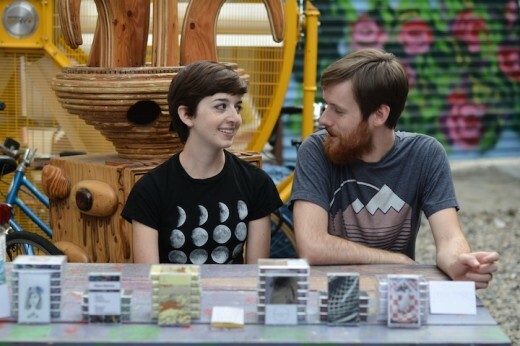 Caroline Teagle, of Brooklyn electronic duo Imperial Topaz, is also a visual artist. She’s responsible for some of the colorful mixed-media artwork seen on tapes from her brother Franklin’s label, Tranquility Tapes. The packaging and accompanying artwork are just as much a part of the experience as the music on the reel. 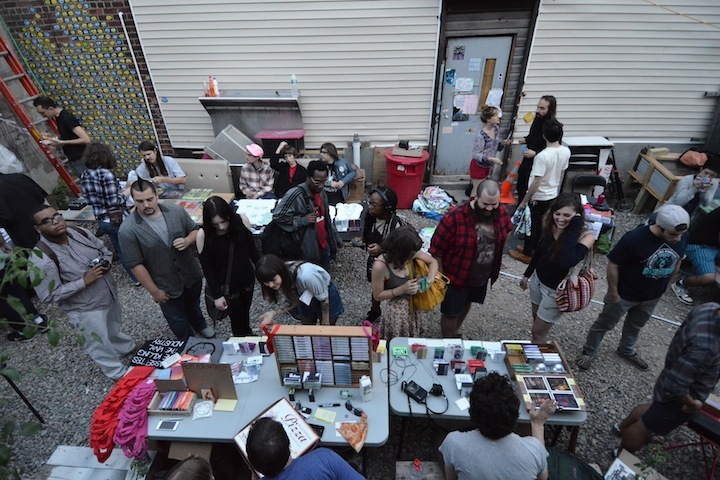 Some of the performing artists — local bands Sleepies and Raindeer, electronic outfits Trabajo and Imperial Topaz, long-time power-pop guys Lame Drivers, among others — also had tapes available at the fest, truly making this a packaged, distributable opportunity for the musicians and visual artists in attendance. By far the favorite topic of the tape makers and collectors at the show involved the economics of the cassette. Tapes were quoted as costing anywhere from 30 cents per cassette to 75 cents. That price includes cutting. Cassettes can be made cheaply and quickly, via a label, or by using a service like Brooklyn-based National Recording Supplies, or even at home. “You can make tapes in your bedroom,” explained Matt Wertheimer of Brooklyn-based cassette label Words + Dreams. Yet profit isn’t really the endgame here (duh). “I’m not taking a cut,” explained Pavlich of Mirror Universe. For impoverished underground bands just trying to get their music out there, the accessibility of the cassette tape is essential. The affordability of tapes also lends to an easier lean toward experimentation – labels won’t lose tons of money for dubbing a tape that might be, er, less than approachable for the uninitiated. For example Words + Dreams had a few copies of OƎЯƎTƧ available, an inverted, more out-there version of the recently released STEREO, a 48-minute quadraphonic piece composed and performed by Patrick Higgins. “When I heard STEREO backwards,” explained Matt Wertheimer, he realized, “it had a haunting, alien quality all its own, and it sounded more or less like a distinct piece of music.” He decided to cut an edition of 15 tapes, inverting the artwork as well. And it’s not just bands doing the work in the tape community — music fans are directly involved in the creative and distribution processes as well. “I’m not actually a musician,” admitted Pavlich of Mirror Universe. Wertheimer of Word + Dreams also eschews the label of musician. Intrigued? You can listen to a preview track of OƎЯƎTƧ from Words + Dreams here. Pissed you missed out? Here’s a list of the tape labels that were in attendance.